Lasal del Varador looks straight out to sea, with a prime location on Mataró’s seafront, where you can enjoy authentic Mediterranean cuisine that is sure to delight all tastes: tapas, paellas and cocktails, all accompanied by good music. We bring you a varied musical selection including jazz, funk, reggae and soul, with a blend of contemporary and classic tunes. During summertime, we put on concerts every Saturday night at 23:30! Good music looking out to sea, all with the Lasal seal of quality since 1993. We’ll let you know on Facebook! Our dishes are healthy and tasty and are created using fresh, quality, ecological ingredients. We strive to achieve a cuisine that in tune with the foods’ own natural flavours and properties. Lasal del Varador is a comprehensively sustainable project. To achieve this, we have built the venue according to the criteria of bioclimatic architecture, using environmentally-friendly materials throughout its construction. We have also installed solar panels to generate our own electricity and a solar thermal energy system to obtain hot water and run the heating. It is time for us to celebrate again! Lasal del Varador proudly received the 2013 Eurosolar Award in the solar architecture category on 8th November for our bioclimatic project and solar panel installation. 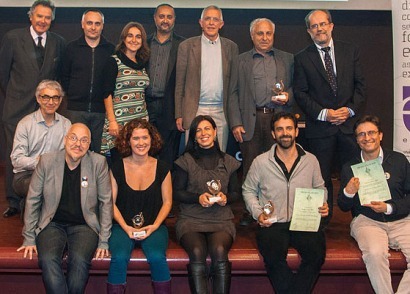 The Eurosolar Awards are given to pioneering initiatives and actions in the field of renewable energy use within Spain. We would like to encourage you to become members of Som Energia! We believe that it is the best way for us to stand up to all the abusive behaviour and say enough is enough! This is the second accolade that we were awarded last year, after the European Intersolar Award. Our new menu is now available! With several new dishes, the menu still includes our classic favourites, which are complemented by the latest additions. A new menu that reasserts our commitment to quality and organic raw materials.